The Star of Bethlehem, also called the Christmas Star, is a star in the Bible and Christian tradition that let the Magi know that Jesus was born, and later helped them go to Bethlehem. According to the Gospel of Matthew, the star made the magi travel to Jerusalem. There they met King Herod of Judea, and asked where the king of the Jews had been born. Herod's advisors said that the Messiah would be born in Bethlehem, a nearby village, because of a prophecy in the Book of Micah. While the magi were going to Bethlehem, they saw the star again. The star stopped above the place where Jesus was born. There, the magi saw Jesus with his mother, worshipped him and gave costly presents to him. They then returned to their "own country". Christians usually think of the star as a miraculous sign to show the birth of the Christ. Astronomers have thought of many different explanations for the star. A nova, a planet, a comet, an occultation, and a conjunction (planets coming together) have all been suggested. Some scholars say that the story is not historically right and that the star was not real. The Star of Bethlehem is a well-loved subject at planetarium shows during Christmas, but the Bible seems to suggest that the magi visited Jesus at least several months after he was born. [nb 1] The visit is usually celebrated on Epiphany (January 6) in Western Christianity and on Christmas (December 25) in Eastern Christianity. Now after Jesus was born in Bethlehem of Judea in the days of Herod the king, behold (see), wise men from the East came to Jerusalem, saying, Where is He who has been born King of the Jews? For we have seen His star in the East [or at its rising] and have come to worship Him. When Herod the king heard this, he was troubled, and all Jerusalem with him. And when he had gathered all the chief priests and scribes of the people together, he inquired of them (asked) where the Christ was to be born. Herod was "troubled"–not about the star, but because a "king of the Jews" had been born. He understood that this meant the Messiah. The Messiah was a leader of the Jewish people, and had been spoken of in Old Testament prophecies. So he asked his helpers where the Messiah would be born. They replied that the Messiah would be born in Bethlehem, the place where King David was born, remembering what the prophet Micah had said. [nb 2] The king told this to the magi. Then Herod, when he had secretly called the wise men, determined from them what time the star appeared. And he sent them to Bethlehem and said, Go and search carefully for the young Child, and when you have found Him, bring back word to me, that I may come and worship Him also. When they heard the king, they departed (went away); and behold, the star which they had seen in the East went before them, till it came and stood over where the young Child was. When they saw the star, they rejoiced with exceedingly (very) great joy. Matthew suggests that the magi knew from the star that the "king of the Jews" had already been born even before they entered Jerusalem. They gave Jesus gold, frankincense, and myrrh as presents. The magi were told in a dream not to go back to Jerusalem. So, they "left for their own country by another road". When Herod found out that he had been tricked, he ordered all male children in Bethlehem who were 2 or younger to be killed. [nb 3] Joseph was warned in a dream to escape. He took his family to Egypt to be safe. The Gospel connects the escape to a verse from the Old Testament, which is seen as a prophecy: "Out of Egypt I called My Son." The Old Testament verse was about how the Hebrews went away from Egypt, led by Moses. Because of this, the quote seems to suggest that Matthew thought that Jesus' life was like the story of the Jewish people. Judea could have symbolized Egypt and Herod represented pharaoh. [nb 4] After Herod died, God called Joseph and his family back from Egypt, and they settled in to Nazareth in Galilee. One way to interpret the Star of Bethlehem is to find the year in which Jesus was born. Matthew wrote that Jesus was born when Herod was king. According to Josephus, Herod died shortly after a lunar eclipse. This lunar eclipse is often thought of as the eclipse of March 13, 4 BC. Those who ruled after Herod used coins showing that they dated their rules as beginning in 4 BC. Because of this, it is mostly thought that Herod died that year. However, some still disagree with this idea. From long ago, many people believed that the movements of the stars were connected with the things that happened on earth. Miracles were often thought to happen at the same time important people were born. By the time the Gospels were written, it was thought by many people that it was about the coming of a Messiah. For example, Josephus quoted it (though he thought it was about Emperor Vespasian). 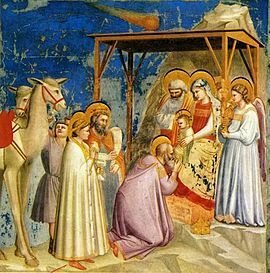 Paintings and other works of art about the magi's visit may include the star. In the fresco by Giotto di Bondone, it is in the shape of a comet. In a tapestry about the Magi, designed by Edward Burne-Jones, the star is held by an angel. ↑ Matthew 2:11. At the time of the magi's visit, Jesus is a "child" (paidon) in a house. He is not a baby (brephos), such as when the shepherds come to see him in Gospel of Luke. (Patterson, Dorothy Kelly, Women's Evangelical Commentary: New Testament, p. 20) He is also with his mother. This shows that the 40 day confinement in the Jewish law has already passed. ↑ Matthew 2:5–6. Matthew repeats the words of Micah 5:2 and 2 Samuel 5:2. ↑ Matthew 2:16 Matthew says that this is because of the prophecy in Jeremiah 31:15. It is similar to the killing of firstborn babies by pharaoh in Exodus 11:1-12:36. ↑ For example, Paul L. Maier, "Herod and the Infants of Bethlehem", in Chronos, Kairos, Christos II, Mercer University Press (1998), 171; Geza Vermes, The Nativity: History and Legend, London, Penguin, 2006, p22; E. P. Sanders, The Historical Figure of Jesus, 1993, p.85; Aaron Michael Adair, "Science, Scholarship and Bethlehem's Starry Night", Sky and Telescope, Dec. 2007, pp.26-29 (reviewing astronomical theories). ↑ John, Mosley. "Common Errors in 'Star of Bethlehem' Planetarium Shows". Retrieved 2008-06-05. ↑ Matthew 2:2. This is the New Revised Standard Version. ↑ Matthew 2:16 The OT version is at Hosea 11:1. ↑ Steinmann, Andrew (2009). "When Did Herod the Great Reign?". Novum Testamentum. pp. 1–29. Case, Shirley Jackson (2006). Jesus: A New Biography Gorgias Press LLC: New Ed. ISBN 1-59333-475-3. "Matthew 2 - Biblical text on the magi and the star in New King James Version". biblegateway.com. Retrieved 4 August 2010. "Star of Bethlehem Bibliography". phys.uu.nl. Retrieved 4 August 2010. This page was last changed on 10 March 2019, at 12:56.